So there was this idea that the Michigan legislature could expand the state’s anti-discrimination to include protections for gay residents, and maybe even the transgender community — straightforward stuff that is already there for race and gender (like you can’t get fired from your job because of your sexual orientation). Politics being what they are, the best chance for doing the right thing is now while the Michigan legislature is in a lame duck session, so some politicians who would never want to be seen as siding with the LGBT community could vote for it. Well, it is not likely to happen. Or even get out of committee. 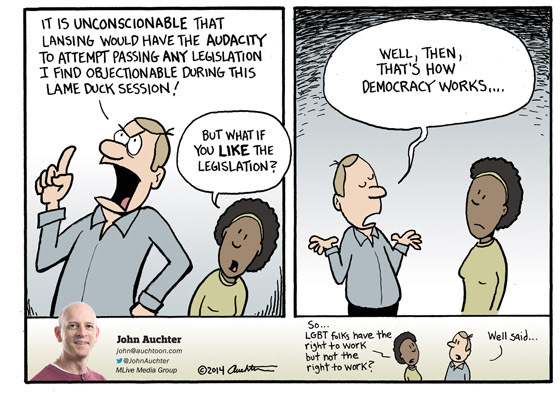 The most hypocritical thing here (and there is lots to choose from) is being against lame duck legislation if you don’t like it, but a happy shrug if you do. Two years ago, the law making Michigan a right-to-work state passed in a lame duck session. What’s a more basic right to work than not to get fired indiscriminately? Sorry John. Anything with LGBT makes me uncomfortable so I am completely against it. Should have seen that coming. No “end sarcasm” tag for me I guess. Yes, Tyler, you will find no sarcasm here. It is simply not allowed. Comments are exclusively for the perfectly serious! Alas, you’re right. No sarcasm tags….